Born in Sinsheim, Baden (Germany), Franz Sigel participated in the German revolutions of the 1840s as a military leader. When the revolutionary forces he led were defeated, Sigel went into exile, eventually making his way to the United States where he taught in the New York City public schools. Sigel moved to St. Louis, Missouri in 1857 to take a professorial position at the German-American Institute. Considered a hero by many German-Americans, Sigel was elected Colonel of the Third Missouri Volunteer Infantry Regiment in May of 1861. Although suffering defeats at the Battle of Carthage and the Battle of Wilson's Creek, Sigel was promoted to Brigadier General of Volunteers and led a brigade at the Battle of Pea Ridge, a Union victory. 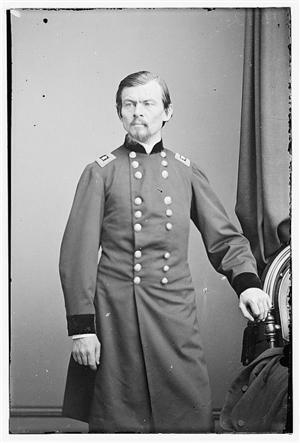 In 1862, Sigel was promoted to Major General of Volunteers and moved to the Eastern Theater of the war. Sigel was placed in command of the First Corps in Major General John Pope's Army of Virginia. Sigel's Corps was involved in the Federal defeat at the Secnd Battle of Bull Run (Manassas). In September of 1862, Sigel's Corps was now designated the Eleventh Corps and assigned to the Army of the Potomac. In 1864, Sigel's forces were decisively defeated in the Battle of New Market by Confederate forces under Major General John C. Breckenridge. Later Sigel made a poor showing against Confederate Lieutenant General Jubal Early forces at Harper's Ferry in July of 1864. Sigel was relived from active command and would resign his commission in 1865. Back: Francis P. Blair, Jr.